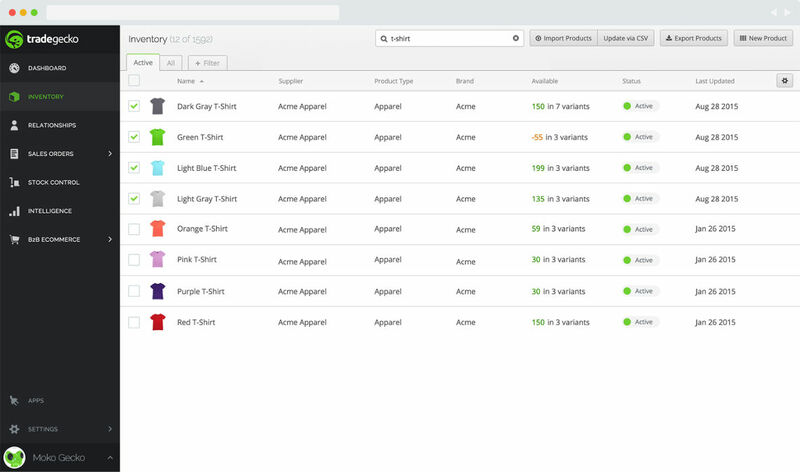 For eCommerce business owners, inventory management is crucial for maximizing profit, reducing storage costs, and keeping track of what you have or don’t have in stock. TradeGecko is revolutionizing the eCommerce market by empowering businesses to be as fast and efficient as some of the world’s biggest online stores. In 2012, brothers Cameron and Bradley Priest, and Carl Thompson saw the need for a more sophisticated inventory management solution after Carl had experienced some inventory issues running his online clothing label. The three partners relocated to Singapore and joined JFDI – a prominent technology accelerator – where they would form the foundations of TradeGecko: a streamlined online inventory management system. Since then, TradeGecko has established a reputation for being one of the foremost inventory management solutions on the market – marrying simplicity, efficiency and control to provide a user-friendly, seamless product to clientele spanning more than 100 countries. While traditionally, managing inventory came down to complex spreadsheets or physical ledgers, TradeGecko’s software equips businesses with the tools they need to manage their business online, from anywhere, at any time. The platform combines enterprise-level tools including inventory management operations, essential business applications, and online commerce solutions – enabling eCommerce businesses to work smarter, streamline operations, and, ultimately, be more profitable. Navigating the constantly evolving world can be a daunting task for even the savviest of eCommerce businesses, which is why the TradeGecko Sales and Success team is on hand to help customers get up and running on the platform and offer continued support. Which businesses will see the biggest benefit from TradeGecko? TradeGecko’s platform is designed to help primarily online businesses manage their inventory and business operations seamlessly – allowing them to scale up and integrate with eCommerce platforms such as Shopify, WooCommerce, and Magento. Wholesale businesses also benefit from the B2B eCommerce capabilities of TradeGecko’s platform, which allows merchants to create a private online store for wholesale customers. The platform’s look and feel can also be customized for brand consistency. TradeGecko Mobile – TradeGecko’s iPhone and iPad inventory management app – is also a complete solution for businesses that need to manage their products, customers, and orders while they’re on the go. The app allows wholesalers and eCommerce business owners to keep their entire product catalog on their mobile device, enabling them to sell anywhere. It also doubles as a customer relationship management (CRM) system, with direct customer contact capabilities. TradeGecko recently launched TradeGecko Payments for wholesale SMEs, enabling businesses in the United States, UK, Australia, and Singapore to bill their customers with a single click using the B2B payments gateway. This addition gives wholesalers full control of their cash flow from a single dashboard outlining account balance, payments, and payouts history, along with a “Pay Invoice” function for faster payment processing. TradeGecko Payments will continue to be rolled out to other countries, and further advanced functionality is in the works. Looking forward, TradeGecko’s focus is customer-first: introducing more merchants to the platform and supporting new and existing customers in their entrepreneurial journey by helping them grow and scale up their businesses online. Sign up for a free 14-day trial of TradeGecko’s order management system or check out their website for more information.